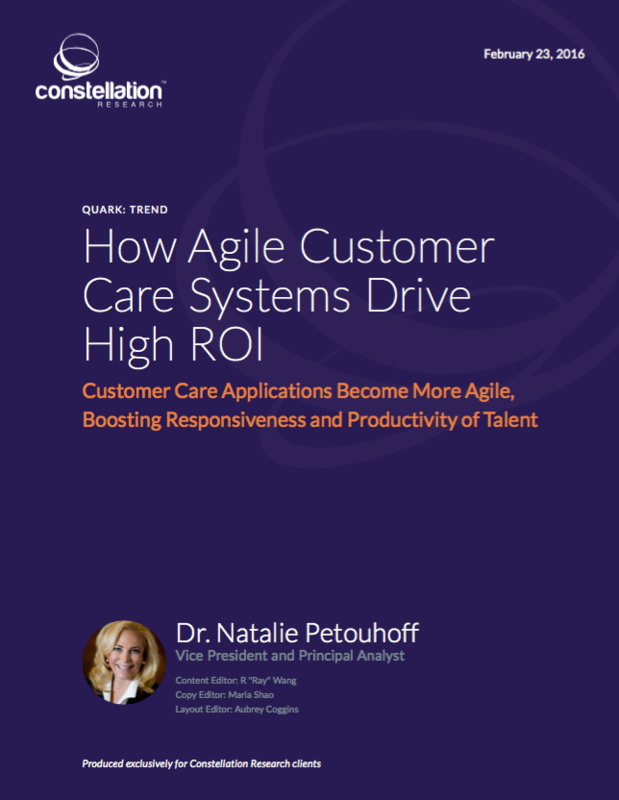 How Agile Customer Care Systems Drive High ROI | Constellation Research Inc.
Today’s customers require companies to provide them quickly with help, support and information in any channel they choose to engage with the company. This means organizations need to be able to quickly implement new workflows, deploy new channels or add new fields, features and capabilities to serve their customers. Nonetheless, companies often struggle with what they see as a trade-off between the much-needed speed and flexibility (agility), on one hand, and the infrastructure required for stability in their technologies and processes. Companies often become bureaucratic because the rules, technologies, infrastructure, policies, and management layers developed to capture economies of scale ultimately hamper their ability to move with agility. This report examines how digital disruption has shifted the consumer–brand-employee relationship involved in delivering quick, relevant and reliable customer care. It examines a shift in thinking: being agile does not require a company to make trade-offs in the speed and flexibility of customer care systems. The paper is based on in-depth interviews, research and case studies. It is written for CxOs and customer care professionals who are not just looking to survive in this very demanding customer-centric care world, but are seeking to flourish by attracting and retaining the best talent in order to provide the very finest agile customer care.